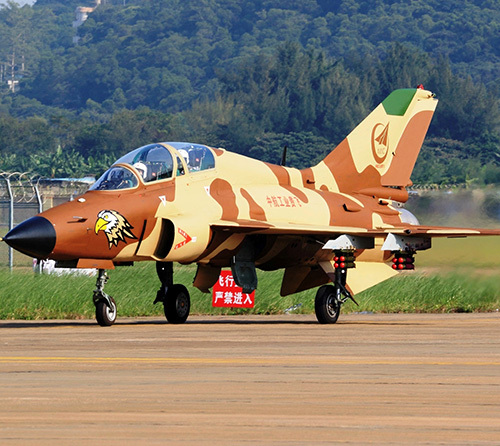 The Sudanese Air Force has taken delivery of its new Chinese-made FTC-2000 jets, the Sudanese Ministry of Defense (MoD) announced on 16 May. The MoD said that a new squadron for the FTC-2000s had been officially inaugurated in a ceremony attended by the Major General Awad Khalafallah Marawi, the Deputy Chief-of-Staff, and the Chinese Military Attaché. It released photographs showing aircraft with numbers running from 1201 to 1206, indicating that all six FTC-2000s that Sudan ordered have been delivered. The order was confirmed by Wang Wenfei, the Director General of Guizhou Aircraft Industries Corporation (GAIC), in an interview published by China Aviation News on 3 November 2016. Marketed by the Aviation Industries Corporation of China (AVIC), the FTC-2000 (photo) is the export variant of GAIC’s JL-9 two-seat supersonic turbojet-powered trainer. The FTC-2000 is an aircraft capable of advanced training tasks for fighter pilots. It can be used by three generations of pilots for primer fighting training and tactical training missions. It also features a capacity for air/ground combat.FeaturesFTC-2000 features a high ratio of lift with a double delta wing aerodynamic layout, remarkable landing performance and superior maneuverability in transonic performance region at medium and low altitudes. In addition, it has balanced the training demands of the third generation fighter. The FTC - 2000 has adopted an intake layout of double ribs on both sides, to effectively improve the downward angle of view in the front and rear cabin. The flight training and working environment for pilots has been improved in order to broaden the pilot’s field of vision. The trainer has the addition of an outer wing tank. The FTC-2000 has also adopted an advanced and integrated avionics system, featuring an integrated display control system. .Other features include a double aftermath technology, integrated display control management; air data computer; pulse Doppler radar; ins/GPS, and weaponry carrying system; task management computer system and other advanced equipment. The FTC-2000 has a remarkable landing performance and maneuverability in transonic performance in medium and low altitudes. It not only meets the needs of the advanced training of fighter pilots, but can be modified as a light strike or other special aircraft. The Aviation Industry Corporation of China, Ltd. (AVIC) was founded on November 6th, 2008 through the restructuring and consolidation of the China Aviation Industry Corporation I (AVIC) and the China Aviation Industry Corporation II (AVIC II). AVIC is centered on aviation and provides complete services to customers in many sectors - from research and development to operation, manufacturing and financing. Our business units cover defense, transport aircrafts, helicopters, avionics and systems, general aviation, research and development, flight testing, trade and logistics, assets management, finance services, engineering and construction, automobiles and more. AVIC has over 100 subsidiaries, nearly 27 listed companies and more than 450,000 employees.